jingle belles: Baby, It's GOLD Outside! "I love following scrapbook trends and incorporating them into my own style. The rush to use lashings of gold on our layouts totally had my name on it and hardly a page goes by without a little (or a lot of) gold finding its way on there! So it was only a matter of time before I'd be overloading my cards with gold too. I love how luscious and rich it looks and am thrilled to be sharing my love of gold with the Belles this week." Lisa Says, "I brought together as many gold elements as I could find in my stash to see how many shades and textures I could incorporate onto my card. Sequins, a doily, glitter paper, foil card die-cuts as well as gold letters are a beautiful contrast to the simpler background. I just let the gold do all the work. " 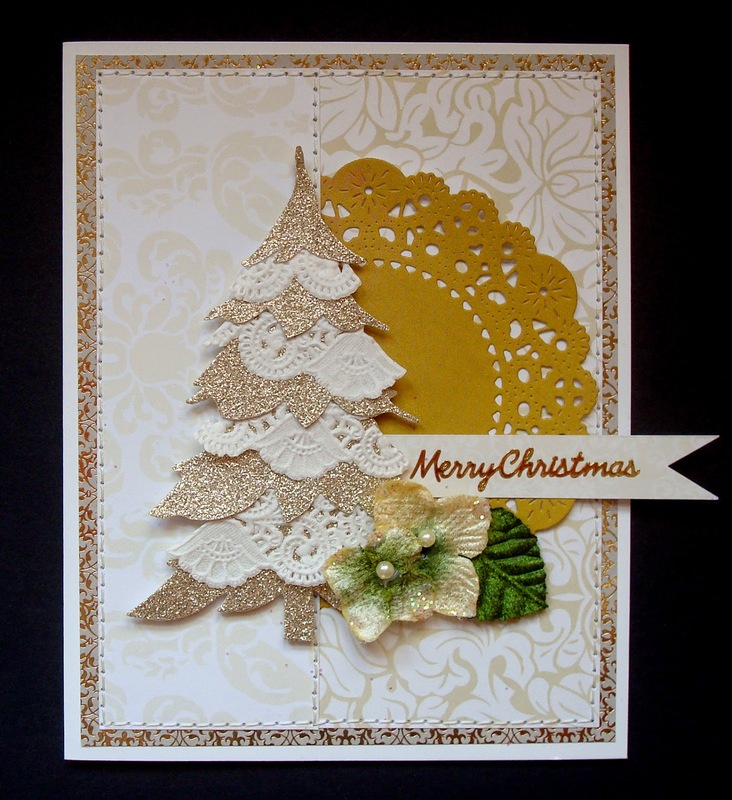 Lauren says, "I've got quite a few golden items on my card: the diecut tree is made from doily scraps I've layered with bits of Doodlebug's awesome glitter-encrusted cardstock; the sentiment is one of those super-shiny foil peel-offs; the little velvet flowers have a touch of gold glitter; and finally the background paper in which I've framed the whole thing is a gold filigree print. I've used Sketchbook Saturday #127 to guide the placement of all my yummy embellishments!" 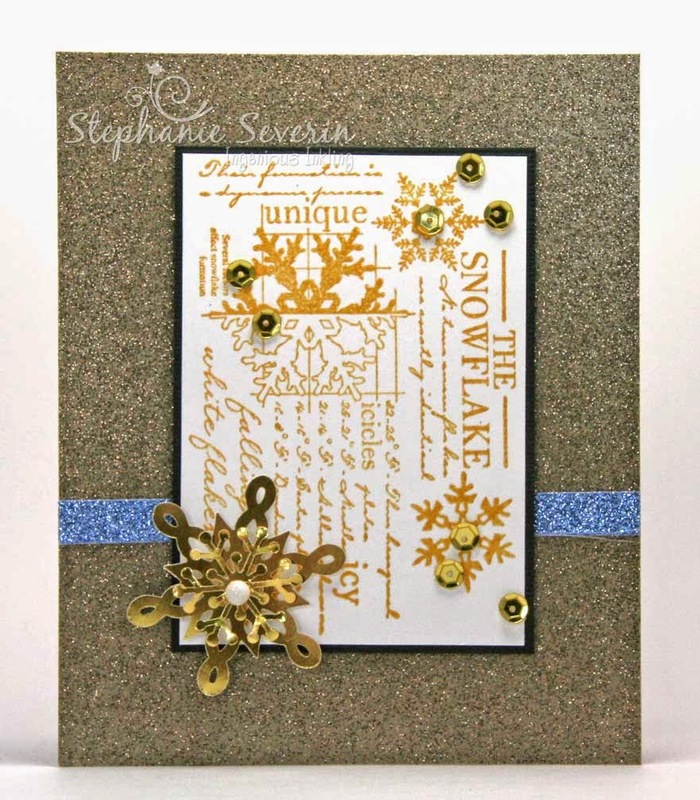 Stephanie says, "I pretty much went all-out-gold as well ... stamping done with Delicata Golden Glitz Ink ... gold DCWV glitter background paper ... gold sequins ... and snowflakes punched from gold foil paper. Unfortunately there was no gold ribbon in my stash (seriously, that must be remedied), so I used blue glitter ribbon instead ... layout is from Tuesday Morning Sketches. So grab your foil papers, your shiniest embossing powder, your golden glitter and sequins or whatever glamorously gilded ingredients make you happy! Link up before 6pm (EST) on Wednesday, September 10th. Keyword for galleries and flickr is JB:14:18. I'm loving all the gold and glittery creations! Ohhhhhhhhhh so pretty!!! Love all the glittery gold!! Great work ladies!! I am excited to see this challenge, since I got caught up on all the previous ones yesterday! Traveling is done for a while so I hope to be able to submit my card once again. Love Lisa's card and looking forward to this challenge. The Hanukkah Song, Verse Two!